EYE CONCERNS - Sjogren's can be more than just dry eyes. Uveitis (pronounced you-vee-EYE-tis) is caused by inflammatory responses inside the eye. Inflammation is the body's natural response to tissue damage, germs, or toxins. Uveitis produces swelling, redness and heat, and can destroy tissues as white blood cells rush to the affected part of the body to contain or eliminate the problem. Blepharitis means inflammation of the eyelids. Anterior blepharitis affects the outer margins of the eyelids (where the eyelashes emerge); posterior blepharitis affects the inner margins (which touch the eye). Anterior blepharitis is generally of staphylococcal or seborrhoeic origin, and posterior blepharitis results from meibomian gland dysfunction. Mixed blepharitis (combining anterior and posterior components) is common. Blepharitis usually causes symptoms of eye itching, irritation, burning, increased tearing, and the sensation that something "may be in the eye." A doctor may prescribe a topical antibiotic and heat or saltwater compresses. Often, doctors may also prescribe antibiotic-steroid combinations. Recently, there has been interest in also taking omega-3 fatty acids for treatment of blepharitis and dry eye. Blink more frequently: Meibomian glands are a special kind of sebaceous gland at the rim of the eyelids. They secrete oil by nerve action and the mechanical action of blinking. The rate of blinking decreases with both age and near vision tasks such as computer use. If you concentrate on blinking more for a few days, especially when you are on the computer it will become a habit that can improve your eye dryness. 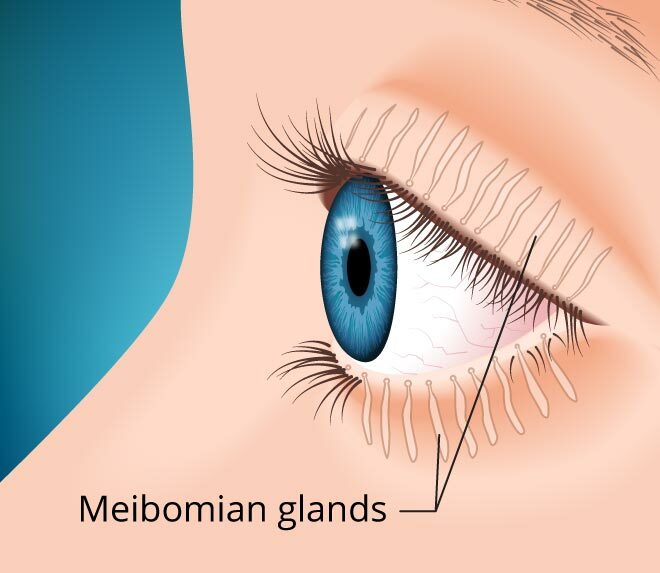 The Meibomian glands, also called tarsal glands, are a holocrine type of exocrine glands, at the rim of the eyelids inside the tarsal plate, responsible for the supply of meibum, an oily substance that prevents evaporation of the eye's tear film. There are 25 to 40 meibomian glands in the upper eyelid and 20 to 30 in the lower eyelid.